Be the first to share your favorite memory, photo or story of Kendall. This memorial page is dedicated for family, friends and future generations to celebrate the life of their loved one. 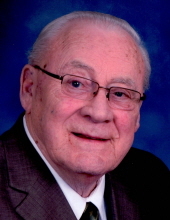 MOUNT HOREB-Kendall Burnell Gladem, age 82, of Mount Horeb, passed away on Wednesday, Feb. 6, 2019, at UW Hospital surrounded by his family. He was born on May 16, 1936, in Dodgeville, the son of John and Dorothy (Squires) Gladem. He married Janice Wiest on Dec. 28, 1959, in Holy Redeemer Catholic Church. Kendall graduated from Mount Horeb High School in 1955. He attended UW Platteville and graduated with a B.S. in education in 1960. He served as a cook for an Army reserve unit for 5 1/2 years. Kendall worked with middle school age children for 30 1/2 years. His first teaching contract was at Chippewa Falls Junior High for three years. Kendall taught at Platteville Middle School for seven years, then Orchard Ridge Middle School in Madison for two years and then Mount Horeb Middle School. He received his M.S. from UW Platteville in 1971 and then received his Administrative Certification at UW Madison. He ended his career at the Mount Horeb Middle School where he retired as principal. Kendall was a member of the St. Ignatius Catholic Church in Mount Horeb. He enjoyed deer hunting and small game hunting. He also enjoyed fishing; especially for bass and muskie. He took great pride in watching his son, Wendell, kick the football and was extremely proud of his grandchildren. He is survived by his wife of 59 years, Janice; son, Wendell (Dawn) Gladem of Mukwonago; grandson, Benjamin; granddaughter, Amanda (Adam Mundt) Pierce; three sisters, Diane Fink, Kim (Vernon Noel) Johnson, and Tami (Brian) Burkhardt; sisters-in-law, Marcy (Don) Schoepp, Valeria (Ed) Sutter, Darlene (Dennis) Cleary, Venita (John) Cleary, Jean (Mike) Ryan, Linda Seaquist, Kathy (Terry) Kurth; and brother-in-law, Jerry (Ann) Wiest. He was preceded in death by his parents; stepfather, Marvin Fredenberg; grandson, Matthew Pierce; brothers-in-law, Dan Johnson and Pepper Fink; grandmother, Josephine Squires; and many aunts and uncles. A Mass of Christian Burial will be held at ST. IGNATIUS CATHOLIC CHURCH, 109 S 6th St., Mount Horeb, at 11 a.m. on Thursday, Feb. 14, 2019, with Father Chahm Gahng	presiding. Interment will be held at Calvary Cemetery, Mount Horeb, at a later date. Visitation will be held at GUNDERSON CAMACHO MOUNT HOREB, 500 N. Eighth Street, from 3 p.m. until 7 p.m. on Wednesday, Feb. 13, 2019 and also at the church from 10 a.m. until the time of the service on Thursday. "Email Address" would like to share the life celebration of Kendall Burnell Gladem. Click on the "link" to go to share a favorite memory or leave a condolence message for the family.